Stimulate your body to do its own work staying young. While Inner Image has always offered many noninvasive techniques and technologies to restore and maintain appearance, these recent additions to our technology stable offer the latest noninvasive techniques to stimulate your own body’s naturally restorative and strengthening processes. EMSella is the first device of it’s kind that is FDA-cleared for treating urinary incontinence in men and women. The 30 minute EMSella treatment uses high-intensity electromagnetic stimulation (similar to an MRI) to stimulate pelvic floor musculature to rehabilitate weak pelvic muscles and restore neuromuscular control. While this type of treatment is selective and non-invasive, it offers deep penetration into the targeted tissues of the pelvic floor and stimulates the muscles. In as few as 3 weeks, patients strongly agree their incidence of stress urinary incontinence was improved by 95%! There are side benefits as well – imagine doing 10,000 kegels in 30 minutes! Learn More About Emsella! BBL Forever Young from Sciton is an FDA Approved broad beam light treatment radically boosts your body’s natural ability to fight skin aging. It is the most powerful device of its kind on the market and has been clinically proven to change the expression of genes associated with skin aging. Forever Young BBL isn’t just a beauty treatment, it’s a preventive regimen that protects skin against sun and environmental damage that adds up over time. 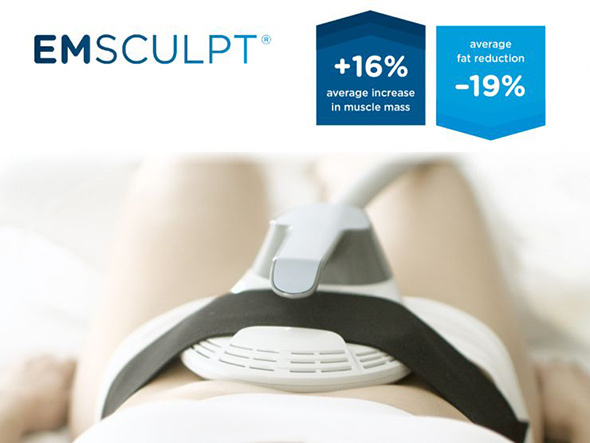 Emsculpt is a revolutionary procedure that simultaneously builds muscle and burns fat through high-intensity electromagnetic stimulation (similar to an MRI) , which is non-invasive, non-surgical and clinically proven body contouring treatment. Emsculpt technology is both FDA-approved and clinically tested in 7 independent, multi-center studies. On average, patients experienced nearly a 20% reduction in localized fat deposits in the abdomen and more than a 15% increase in local muscle mass in the abdomen and buttocks.